Time and time again I see toddlers benefiting from impulse control – ours, not theirs. Our natural tendencies to project and protect when our children seem challenged invariably lead us to intervene too much or too soon. These good intentions can then spoil rich opportunities for physical, cognitive, creative, social and emotional development. During a recent RIE Parent/Toddler Guidance Class, a 14-month-old girl stood holding a miniature blue rubber bowl in her hand and a red one in her mouth. A boy a couple of months older walked over and took the bowl out of her mouth. I was sure the girl would be upset or, at least, complain, but I waited to gauge her reaction. She just looked at the boy with interest. Then the boy took a “sip” from the red bowl. The girl followed his lead, sipping from the blue bowl still in her hand. After this jovial toast they separated, moving on to other activities. A grandfather visiting that day had also witnessed the exchange, and we shared appreciative smiles. This would never have happened had I stopped the boy from taking the bowl or insisted he give it back. 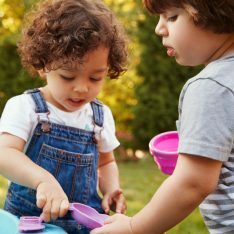 Through infant expert Magda Gerber, I’ve learned that observing sensitively, taking cues from our children, intervening as minimally as possible and allowing situations to play out can bring surprising, positive results. Language – words like “blue”, “box”, “sit down” and even abstract concepts like “right now” are understood and verbalized. Social skills – communication, taking turns, self-control, delayed gratification. Self-confidence and resiliency – I can do it (figure it out, handle it). 1. If it looks like there might be a struggle or conflict developing, move closer as calmly and quietly as possible. 3. Keep children safe. Block any hitting, pushing, biting or hair pulling with your hand and say something brief and simple to the child like, “I won’t let you push. I see you want the toy. Joey is holding it now.” Be there to spot when children are struggling with a physical challenge–close enough to break a fall. 6. If children continue to struggle and intervention seems necessary, try doing just a little to help so the children can learn and accomplish more. For example, if two children are both determined to have a toy, first point out an identical one (but don’t hand it to them). Or if a child is physically struggling, give direction and a bit of help the way the mom in the video does. 7. Reflect on the incident afterwards (if the child seems interested) to help her absorb, process and learn from it. I appreciate your publishing this video, but I’m having trouble figuring out how to apply these lessons with my kids. I have 20-month-old twins, and the pattern of interaction is that 90% of the time, my daughter takes toys from my son, and he gets upset but doesn’t take them back from her. I wonder what you would advise in this situation–two kids, spending all day together, one constantly having his toys taken away from him. I worry about what it’s teaching my daughter about how we interact with others and what my son is learning about his power over his world (or lack thereof). My husband and I have responded so far by teaching language around taking turns, encouraging our son to stand up for himself a bit and not allow his sister to grab things, and not allowing our daughter to take things from him. We try to encourage them to wait til the other is done before taking a toy, but that’s not working very well. Also, obviously we can’t be constantly watching every interaction these two have. Any thoughts? I can understand how challenging this situation feels. The biggest challenge is to remain impartial when power struggles seem so one-sided. To a great extent, siblings have to be trusted to develop their relationship, even when it doesn’t look rosy to us. So, I wouldn’t worry about intervening all the time. When you do intervene, I would focus on giving your son some tools like, “If you want that, you can hold on.” Or, “You can say ‘no, I’m using that”. Be careful not to take sides, but just offer some ideas for him. Stopping your daughter from taking things can make it even more intriguing for her, but if you see her doing it repeatedly during one play period, I would stop her by placing a gentle, but firm hand in her way and saying, “I won’t let you keep taking things from your brother. Please find another way to play”. This has to be said in a calm, matter-of-fact way for it to be effective…because that makes in an uninteresting thing to do. If you get at all emotionally involved, it will be harder for your daughter to stop the behavior. What a great video! I was reflecting on just this issue the other day with my 26-month-old. He was playing outside, throwing sticks into a bush, and one stick became stuck in the bottom of his shirt. He started screaming as he does when he gets frustrated. Usually the screaming gets to me and I want to fix the problem right away so he’ll stop. But this time, I was about 40 feet away watching him, and I decided to just sit still and watch, to see if he wanted me to help. I kept expecting him to look over at me and ask for help, but he never did. He was clearly frustrated but finally got the stick loose. It made me realize that just because he screams about something doesn’t mean I need to intervene immediately. At the moment we are both working through how to respond when his toys are consistently taken away by one particular child. I’m trying to give him the space to respond to the situation on his own whilst giving him some language to use. What makes it so challenging is that this child seems to seek my son out, follow him around and take whatever it is he has with seemingly no intention of playing with it. If you have a post on this somewhere I would love for you to direct me to it. This is a great video. Thank you for sharing. I am a total believer that babies and toddlers are able to tell you when they need you. So, I don’t interfere when my daughter (16months) is in a conflict over a toy, I don’t swoop in and rip a toy out of her hands to give it to another child who wants it and I don’t like it being done vice versa..but time and time again I see other mums do just that. It annoys me, to be quite frank. I sit back and let my daughter play, let her explore, help her when she’s stuck (like the mum in the video) and if there is a conflict I try to talk them through it..just like in the video. Someone who shares my feelings / experiences! The hardest thing about RIE , is OTHER PARENTS. In the home , or out and about with chill, relaxed and or even older generation, people are fine… even if it’s not their cup of tea, they get it. But to be fair, most people in my area judge me / us, and when I sportscast at the local playgrounds, so many mothers think I’m nuts. Respectful parenting is hard around a lot of the general public. Even my parents, who are traditional Greek and the epitome of distraction hurting, they get RIE. Well , maybe not my dad 100%, but they get the point. I agree with all of this… but until last week it was easy for me not to intervene. Then I had to watch my 14 month old daughter 3 times scream and cry at another little girl because that girl touched her toys or lent on me. I was upset and I felt annoyed with my daughter. It took all my energy not to intervene too much. She’s been very vocal lately at anything or anyone that bothers her or steps in her way. Remaining impartial and not get emotionally involved is a great test in patience. Hi Kay! Another child leaning on you is understandably upsetting, especially if your girl is in the throes of separation anxiety. The screaming sounds very typical to me. It’s a way of saying “don’t touch” and it’s effective! Try not to get annoyed about this. Expressing her feelings at this age is very positive. She is just beginning to understand and express her “will” and experiment with social behaviors, so give her full permission and withhold judgment. This is all good! Although I know it’s hard to feel that way. Thanks for sharing yet another great example, Janet. It is so helpful to see these moments caught on video and to have you deconstruct what took place. I’m reminded of why I value this approach and how I can do it better. Yes! I particularly like #5. Using this approach rather than commands has worked wonders in our home. I also have worked extremely hard NOT to intervene when my son and his peers are “challenging” one another. On very few occasions have I actually had to intervene. Kids are amazing and resilient. Allowing them to use and therefore develop vital social (and emotional) skills will help them succeed in life (as tough as it is for us adults not to intervene). 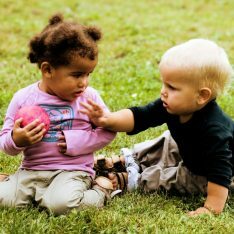 Conflict resolution is a skill that will certainly come in handy throughout life and is a skill that many adults lack today. That left a huge smile on my face. I find it so touching, beautiful and inspiring how these little people are so clear, so in touch, and so capable. I really think I am thankful every day that I was introduced to RIE. Thank you for the video. I’d love to see more! This is such important parenting message–so important for all educators of children of all ages. I did the math. by the time a child walks in the door of a kindergarten he or she has been using the scientific method on the environment for 43,800 hours. This represents considerable expertise that should be used and built upon rather than ignored. It might help for readers to check out Joyful Toddlers. Also, when you say, “…were you worried…” to me, is part of the adultification of young people. At this developmental stage, worry is a premature construct. It’s like asking this kid to do some calculus. It’s better to just mirror with observations what you see happening, instead of solving problems. Your calm demeanor will most likely result in the child figuring out how to get her foot out of that position. Also, you should get another person to do the filming. Remove yourself as the camera person. I think you are holding the camera, and it is modeling “multi-tasking”, and brings technology into an otherwise sweet environment. How can you truly be in the now – especially with technology – when you are multi tasking? And I would be careful about filming kids anyway, because children are not on this planet for us to observe like lab rats. They are human beings and deserve consideration and respect – especially considering the fact that they cannot say no to the camera at this stage. Beverly, you make me smile. Criticism after criticism and then in the end, you don’t believe this video should ever have been made! I know many Montessorians, but, happily, none so judgmental. To clarify.. I don’t understand what you mean by my trying to “solve problems” by empathizing with the child after her mini-ordeal. I agree with you about filming. I have very mixed feelings about it and seldom do it, but it is so much easier to understand how to handle these situations when one can see them. So, occasionally I “multi-task” with the children I enjoy spending time with each week. We have a lovely relationship. The videos I have shared from my classroom have helped many parents, teachers and caregivers to understand respectful child care. Yes, it’s a bit of a trade-off, but I’ve made peace with it. And the children in my classes are always respected. This is one of the hallmarks of the Montessori education philosophy from 100 years ago. Dr. Maria Montessori promoted ‘never do anything for a child they can do for themselves’, which tends to be far more than modern day parents would like to believe. But what if your child is a biter?? I often intervene when I can see what is about to happen because if I don’t…someone will get bitten. I’ve tried to just let them work it out…up to that point. But I always need to be vigilant. Hiya do you use the same principles for 3 year olds, or do you have different expectations for them to interact socially by then? This is very timely for me as I have a big 11 month old baby who goes straight up to other wee ones and more often than not they end up crying sometimes just from this bigger bubba coming over. And of course he reaches out to touch eyes and hair sometimes grabbing hard. I have been quick to jump in and pull him away not wanting him to hurt others but I have wondered what message I am already giving him. I dont want to squash his going happily up to others but nor do I want them to be hurt. Janet, great post, and I have really like others of yours as well. Thanks for being such an advocate for and contributor to children and parents (and parent educators, too). Hey Janet. I’m trying to fully understand your principles in order to apply them. My kids (5 and 3) are always on a power challenge that all the time ends with her (5 yrs) being quicker, stronger, etc than him (3 yrs). She takes his thgs depending on her tools of age and length even. And he always comes crying to me! Isnt that sort of asking for help? Hi Rania – How do you generally respond in these cases? “Crying to me” generally indicates that you try to fix these situations, which can actually make it much harder for them to get along. The older child tends to feel you are against her and takes those feelings out on her sibling. 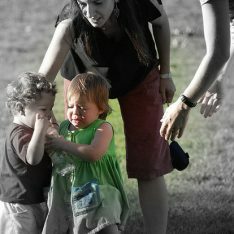 The younger child feels helpless and dependent on you to help handle his sister.